Looks so real packaged right from the Undertakers Lab! Almost like the one at your local Grocery Store... with Splatters of RED fresh looking Blood! 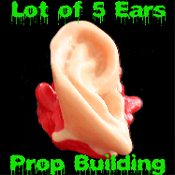 Made of hollow-back rubbery plastic for both indoor and outdoor Use.